Joey recently had the opportunity to review the newest addition from Writing with Sharon Watson - Illuminating Literature: Characters in Crisis. We are both learning a lot! Illuminating Literature: Characters in Crisis is a high school literature program written for Grades 9 - 12. Written from a Christian viewpoint, IIlluminating Literature: Characters in Crisis is meant to be over a year-long period or typical "school year". Characters in Crisis can be used in a group setting (co-op) or it was designed to be used independently by your high school student at home. There is not a pre-requisite literature program that needs to be completed prior to starting Characters in Crisis, so it can be started whenever you decide to start. But it does serve as a full literature credit for a high school graduation requirement. The list of required literature is what drew Joey in to Illuminating Literature: Characters in Crisis, ok it was the second selection that drew him in. This is a list of stories covered in this year-long program. 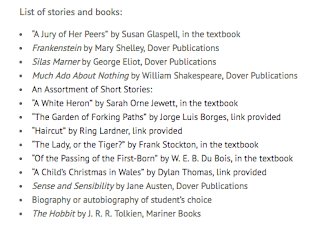 Some of the stories are included in part/whole in the student workbook, but there are a few books that you will need to either purchase or borrow from the library. Mostly the Dover publications copies are what has been required to-date for us, so I've only spent roughly $5.00 the most on a book for Joey. Most of these though could easily be found at your library. The set that we received from Writing with Sharon Watson included, the Student Textbook ($43), the Teachers Guide ($18), Quiz and Answer Manual ($9). We also needed the Novel Notebook, but this is a free download from the Writing with Sharon Watson website. So I purchased a 3 ring binder to keep this notebook in. The Student Textbook includes a Lesson plan suggested schedule for each literature piece that you will be studying. Some pieces you will spend a couple weeks on, while others like Frankenstein are suggested to be completed over a month long period. Each lesson is sorted under a literature piece, so it's easily understandable as to what you need to do. This makes it easy for building independent studies. There are book suggestions for further reading, as well as extended activities that really can make your study of each literature book a full study. Some activities include art, music, writing and also entertainment activities (such as watching the movie of the book). The suggestions are meant to help you in planning other subjects and tie them into your literature studies. I really liked the one under Frankenstein for creating a map of the towns and areas where events in Frankenstein occurred. The Teacher's Guide is very useful if your student is using Illuminating Literature: Characters in Crisis independently. Whereas I have been working right alongside Joey, so I can tell if he's answering questions correctly, if you haven't read the book selection you will need the Teacher's Guide to check your student's work. It also gives you a suggested timeline so that you can make sure that your student stays on track to finish their 39 lessons. The downloadable Novel Notebook that is provided free from the order page is a great addition to our studies. It contains several thought provoking questions for each chapter in the two literary pieces that we have completed during our review period. I like the bright colors and the neat notebook pattern that was created with this notebook. It makes it more interesting than just staring at black and white typed out questions. 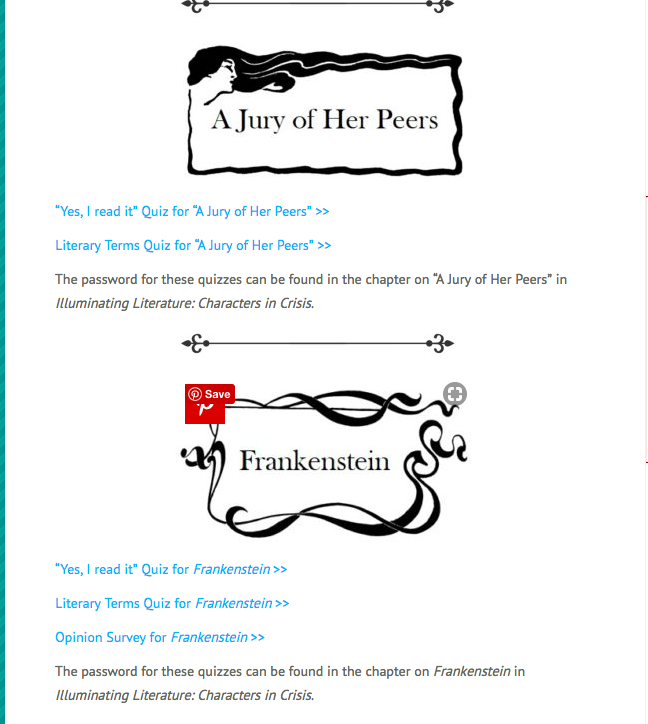 Not only does Writing with Sharon Watson provide a wonderful free downloadable notebook, but they also have online, self-grading quizzes for each one of the novels. Your Student Workbook provides login information for your student. You can check out downloadable samples of Illuminating Literature: Character in Crisis on the Writing with Sharon Watson website. They have a very generous sample that will really give you a full view of their program. To let you know a little about Joey, he is in high school, 11th grade. But he is delayed in some areas, including math. He has comprehension delays. So I was really nervous about tackling Illuminating Literature: Characters in Crisis with him. All the different parts, including the Student Textbook, Novel Notebook, and even the Quiz manual seemed like too much for him to keep track of. He has not been able to use this program independently. But it doesn't take me very long to lay out his assignments each week, and when he needs to complete parts of his Novel Notebook or Student Textbook we spent 15 - 20 minutes and complete it together. Although one day he surprised me, and completed his section all on his own. So I was very happy about that. 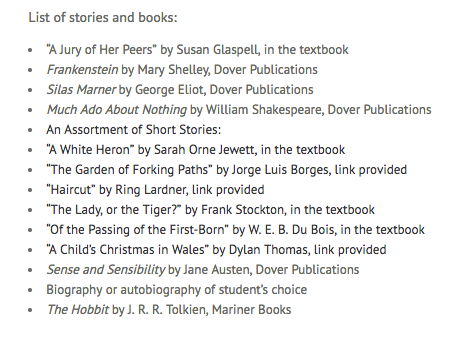 I really like the literary selections in Illuminating Literature: Characters in Crisis. I'm actually reading them alongside Joey (to make it easier for me to help him due to his comprehension delay). And I look forward to each new selection. I thought I may have lost him during Frankenstein, but Sharon Watson has included enough humous anecdotes and references that he understands, that I was able to keep his attention. 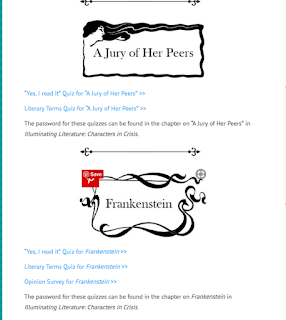 We tried hard to follow the suggested schedule, and actually I speeded up the Frankenstein study a bit since I wanted to finish it prior to our Fall break. Even with his delays, Joey has been learning quite a bit using Illuminating Literature: Characters in Crisis. This has been a great program to help him learn more about various characters and literature elements. He may not "use" this information after his graduation, but it will help him to appreciate the books he continues reading throughout his adult life. I do like that you can adjust the schedule to what works for your family. You also can pick and choose items in the Novel Notebook that you want to use and you do not need to use it all. I don't recommend skipping anything in the Student Textbook though. The information there is all necessary and a great addition to your learning scope. I am actually planning on purchasing the other program by Sharon Watson - Illuminating Literature: When Worlds Collide for Joey for next year. The prices are very budget-friendly. I like the Christian viewpoint that this program is written from (but it's not "religious" or "preachy"...just a few references to God), and best of all.... the work is done for me!! I don't have to worry about matching up lessons or creating questions for the books he is reading. What a great time-saver for me! I definitely recommend you check out Illuminating Literature: Characters in Crisis for your high schooler! 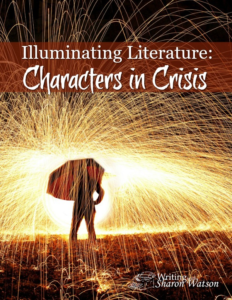 Several members of the Homeschool Review Crew were given the opportunity to review Illuminating Literature: Characters in Crisis from Writing with Sharon Watson. Click on the link below to see how they used this product in their homes and how they felt about the newest addition to the series. Hi, Renita. Thank you for your review! I am so in awe of your teaching procedure, how you walk alongside your son to help him understand. What a gift you are giving him!